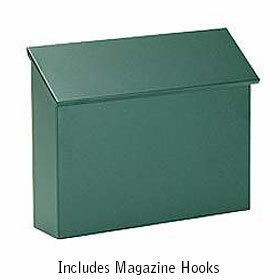 Green Standard Horizontal Wall Mount mailbox made of electro galvanized 20 gauge steel and powder coated. The mailbox includes a 5 inch detachable magazine rack. A factory installed stainless steel locking security kit with two (2) keys is available.